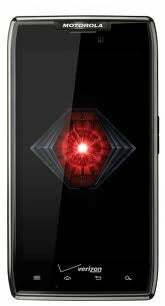 Verizon today announced another addition to the Droid family of smartphones, the Droid Razr Maxx. The company says the phone is aimed at heavy multitaskers with its long battery life, which Verizon says is more than 21 hours on a single charge. The Razr Maxx is just 8.99 mm thick, which makes it a bit thicker than the original Droid Razr at 7.1 mm. Verizon says the Razr Maxx comes equipped with 32 GB of total memory and will be $299.99 with a new two-year customer agreement. No release date was mentioned.